In the course of 10 minutes yesterday, I ran across two mentions of the saxophone (my main axe) in both Newsweek and Time magazines that are worth mentioning. And the Muppets were on my mind, too. The first was an obituary for Peggy Gilbert, who was one of the first female jazz saxophone players to make a true impact on the world. Gilbert, who died at the age of 102 (see what music can do for you? ), shared the stage with such greats as Benny Goodman and Louis Prima, and she didn’t subscribe to the notion that men are better musicians and band leaders than women (and you shouldn’t either). The obit reminds us that Gilbert took on Downbeat magazine when it ran a commentary that seemed to detail how men are better than women. Thanks, Peggy, for being brave and creative! The second mention was a bit stranger. The article on comedian Jim Carey and a new movie called The Number 23 features a striking picture of Carey, with tattoos and muscles, holding a saxophone like a weapon. I couldn’t find the reason why his character has the saxophone but it doesn’t look good (for him or his saxophone). Maybe the muse plays a supporting role. This is another installment in my series of poems I am writing and podcasting every month under the banner of One Poem Per Month for a Year. I wrote it as I watched my oldest son (age 9) playing basketball the other day and was amazed at his athletic abilities and I was wondering where this passion for sports came from (music was my thing). And we had just visited the San Diego Zoo, so animals were on my mind. The gazelle inside of you came from somewhere but not from me. I am more like a crash of rhinos with heads lowered, eyes narrowed, horns raised up in defiant defense. darting, moving, skirting the horizon with energy and freedom. as you surprise your opponent with stealth and speed. No one expected that of you. as if it were but a balloon on a string on a windy day. with weight and worry draped like an anchor around the neck. I could never run like you. Never. but the gazelle never gazes upon the rhino except in times of need. And now I know. Now, I know. determined to protect you at any cost from the slow and steady pull of gravity in the world. Actually, it was nice to reflect upon that experience many months later and realize that more than the tools that I was exposed to, it is the network of new friends and colleagues that remain the strongest link of the week in Chico. I am still very close to a handful of Tech Matters people (Bonnie, David, Tonya, Maria, Mary, Joe, Troy, Karen, Paul A. — among others) and that is important to me. 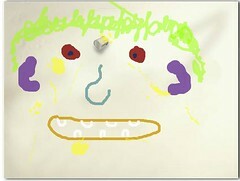 I just got back from California (San Diego) with my family (Legoland, San Diego Zoo, and SeaWorld were all highlights) and I was in the mood for something different, so I popped over to Artpad, where you can make your own drawing and let other people see the process of creation (warning: art has never been my strong suit). Apparently, you can also add to my painting, if you so desire. Charles Hodgson, of the Podictionary podcasts, looks at the word Immigrant and ventures into the tricky terrain of digital immigrants and digital natives. I found my way to a site called Fodey that allows you to create an instant fake newspaper front page. Very fun. So I created this little project, which comes on the heels of a day where I spent most of my time asking the class to be quiet, listen and pay attention (to little avail). PS — I don’t really want to a silent class. Over at New York Magazine, writer Emily Nussbaum has written a lengthy look at why in the world young people would want to blog their lives out to the world. It’s an interesting examination of the rationale that some 20-year-olds are using when they write personal stories or post personal pictures. As an educator, the stories from her interview subjects also give me some perspective into where my sixth graders are going in the years ahead and how I can think about getting them to ask questions of themselves and others before they plunge into the Webbed world of information. Why do we always have to take sides? I am preparing a workshop this week for the Pioneer Valley Reading Council and my topic is Digital Mathematical Picture Books, which were a great success with my students last year and are becoming a topic of a chapter for a book I am co-editing about how technology is changing the way we teach writing (although this year, the curriculum focus will be on science). I prepared this little movie as an introduction to the workshop. and decode its unfolding creation. Its poetry is waiting to be found. that can relink/respond to this automated HTML-XML-Web 2.0 world. teach the machine when we post, tag, name, link, export, map, save, organize. define it as flexible humans designed to forge and expand together. Ethics/Aesthetics/Rhetorics: names teaching us of ourselves. Peace (beneath the surface of text).